Sanity-destroying cosmic horror can be hard to wrap your head around, so Deviant Artist DrFaustusAu has begun rejiggering H.P. 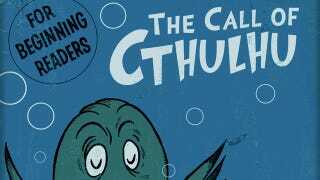 Lovecraft's classic short story as Dr. Seuss book. Now, children of all ages can learn about he who slumbers in his house at R'lyeh. It's kookily impressive, and we're jazzed to see the artist's further work on it. Hat tip to Exploriens! Update 11/27: DrFaustusAu has been plenty busy adding pages, and it looks like he's almost done. Check it out! Hat tip to Morris.